This Pack of 180ml is convenient as charging for those with the jar with dispenser. Feed for fish of medium size. 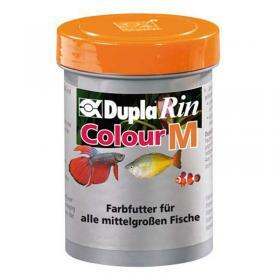 Granulated food for all complete aquarium fish freshwater and marine medium size. Rich in valuable nutrients natural tropical microalgae and over 17 essential vitamins that ensure the welfare of the fish. Enriched astaxanthin (75 mg / kg) for even more brilliant colors and to stimulate reproduction. Contains no dyes. Recommendations for use: 2-3 times a day (as needed to be consumed in minutes) directly onto posizionacibo Dupla.